to ensure that the European Parliament, the European Commission and the Council of Ministers take into account the social economy and its actors whilst developing their policies. Meetings are organised every two months on a regular basis, either in Strasbourg or Brussels. They bring together MEPs, representatives of other EU institutions and representatives of civil society. The intergroup follows closely the work of the European Parliament’s Committees. It can make proposals, and inform MEPs about relevant issues for the social economy. Considered as genuine awareness raising tools, memorandums have been developed in view of a greater recognition of the social economy. The intergroup can call upon the Council and/or the European Commission to offer a clear answer to questions of concern to social economy actors on a wide range of topics. Support is provided to the organisation of events aimed at the promotion of parliamentary work on social economy. The social economy intergroup is also able to disseminate information to the press in order to inform the European citizens of matters of interest. The social economy intergroup already has a positive track record. Created in 1990, it was successively chaired by French MEP Marie-Claude VAYSSADE, Italian MEP Fiorella GHILARDOTI, French MEP Marie-Hélène GILLIG, and Belgium MEP Philippe BUSQUIN. During the last legislative term, the Social Economy Intergroup was co-chaired by Italian MEP Mario MAURO (EPP) and French MEP Anne FERREIRA (PES). Throughout the years, the social economy intergroup has played a significant role in the EU democratic process. In 2005, members of the intergroup triggered the demand for the establishment of an own initiative report on Social economy in the European Parliament. The request was accepted in 2008. Italian MEP Patrizia TOIA was appointed rapporteur for the Employment and Social Affairs Committee. The report was adopted in plenary on 19th February 2009 with nearly 80% of the votes in favour. The intergroup bi-monthly meetings have provided precious opportunities for discussion for more than 30 EU and national level organisations. 43 MEPs were members the intergroup. SOCIAL ECONOMY EUROPE’s secretariat provides a strong logistical support to the social economy intergroup. The intergroup works in a transparent and accountable manner. A publicly accessible webpage for the social economy intergroup is available on SOCIAL ECONOMY EUROPE’s website. 6 March - Brussels (Belgium) - Salvatore Vetro speaks at the Social Economy Intergroup “Social Dialogue and Social Economy, State of the Art?" 20 June - "SGEI Entrustment Acts: Which Initiative for the Social Economy?" 30 May - "The Social Economy in the Member States. Where does the EU Added Value lie?" 12 October - "Reform of State Aid Rules to SGEI" - This one was realized together with the Public Services Parliamentary Intergroup. ENSIE followed the different public hearing with a particular interest. 16 June - "The new Cohesion Policy & the New Structural Funds post 2013"
12 April - "The Social Economy in the EESC President’s Work Programme" and "The Modernisation of EU Public Procurement Policy"
2 March - "Financial Instruments for the social economy enterprises"
ENSIE and Social Economy Europe suported the protest of the Romanian civil society against the law on social enterpreneurship ! Here you can find the two letters to the Romanian Ministry of Labour, Family and Social Protection and to the Committee on Economic policy. The renewal of the Social Economy Intergroup was confirmed in December 2009. From January on, ENSIE is with Social Economy Europe, of which it is a member. The members sought to establish the necessary structures to enable the Intergroup to work in a more efficient way and to provide the expected results. An assessment of activities and a review of the functioning of the Intergroup took place. Weakest points were identified and solutions were proposed, particularly regarding the smooth running. Divergences in expectations and objectives to be reached were thoroughly looked at. A wide consultation regarding the topics to be dealt with was launched among civil society actors engaged in the activities of the Intergroup, so ENSIE was also questioned. Decision was taken that the Intergroup's activities would be fully included in the European Parliament's work. Specific recommendations in link with the subjects dealt with during public hearings were edited and sent to members of the European institutions. Six public hearings were held and three of those led to the drafting of recommendations. One hearing was organised jointly with the Public Services Intergroup. ENSIE attended all the hearings. In the hearing of 6 April, Salvatore Vetro presented the network and the recommendations of the peer review "The Social Economy from the Perspective of Active Inclusion. Employment opportunities for people far from the labor market". This peer review was organized by the European Commission at the request of the Belgian government. ENSIE participated in the round table "Social Economy: the challenges", organised by the MEP Patrizia Toia and Bernard Lehideux on 20 January in Brussels. You can find here the agenda of this meeting. The renewal of the Social Economy Intergroup was confirmed in December 2009. From January on, was with Social Economy Europe, of which it is a member. - a conference organized by the Socialist group in the European Parliament, with the support of MEPs Harlem Désir, Stephen Hughes, Joel Hasse-Ferreira and Anne Ferreira – speakers include the Commissioner for social affairs Vladimir Spidla, members of the European Parliament and the ESCE, representatives of the European Commission and social economy actors. 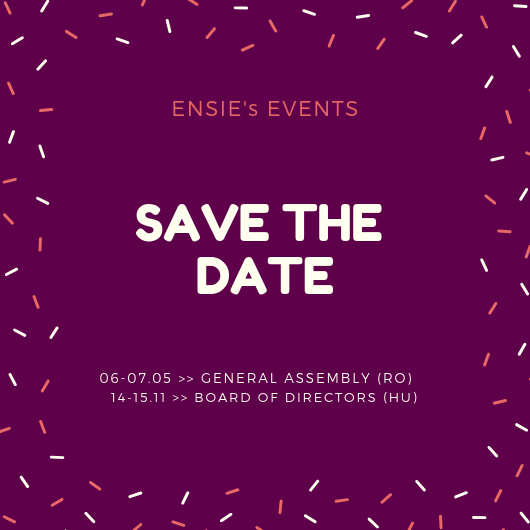 In 2008 ENSIE took part in the seven meetings of the Inter-group as recognised organization of social economy, privileged contact for the specific problems relating to the social integration companies. - to see site SEE (http://www.socialeconomy.eu.org/). The Inter-group also produced a “Social economy”, Memorandum. In 2007 ENSIE took part in the six meetings of the Inter-group as recognised organization of social economy, privileged contact for the specific problems relating to the social integration companies. On the 21st November, 2007 ENSIE presented its activities to the other recognized actors of social economy. The inter-group has been supported by the two vice-chairmen: Philippe Busquin and Mario Mauro. Parliament. It can’t stop any decision. It has an informal function. social firms). ENSIE met the Commissioner Mr V. Spidla. ENSIE is also active in the Social Services Intergroup. Here, you can find the annual report of the Integroup in english. Europolitic has published an intersting document on Social Services.